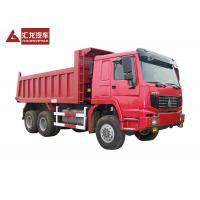 Home Companies Hubei Huilong Special Vehicle Co., Ltd.
All-wheel drive tipper trucks usually carry out the task in mining area. Solid metal mines are loaded and transported. The construction of hydropower plant and river closure also has a demand for heavy dutytransportation. HOWO all-wheel drive series are developed based on decades ofexperience for producingoff-road vehicles. The mature technical platformlaid the foundations for the wide applicability. The tipper truck has the advancedEuro III motor. Technicalfeatures of the truck are energy-saving, eco-friendly and high-efficient. Typical characteristics of the motor cover high reliability, large torque, and low emission etc. Thetipper truck with all-wheel driveconfigurationis qualified for the exploration and transport in bad road conditions, like roadless areas, rough roads, swamp, wetland etc.